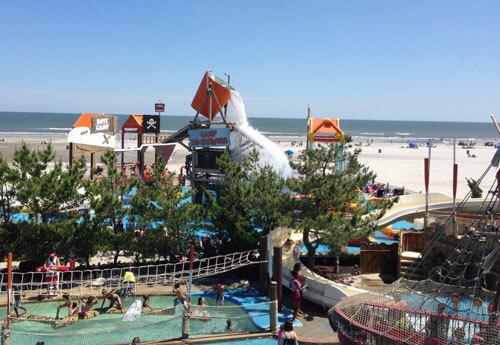 As if today’s intense water parks aren’t fun enough, how about a water park that overlooks the Atlantic Ocean? Bonus! Raging Waters at Morey’s Piers in Wildwood, NJ, offers some unique features that elevate the fun factor over and above any water park I’ve ever visited. 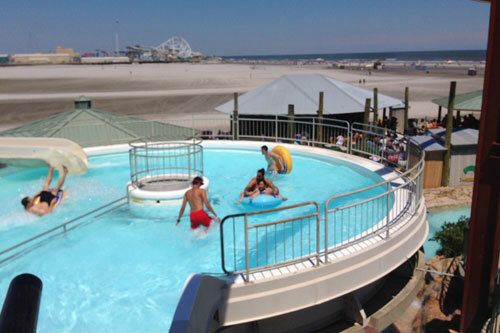 Morey’s Piers consists of three piers teeming with water parks, thrill rides, food, games and other attractions. Raging Waters Water Park is located at the end of Mariner’s Pier, right on the beach, which is a stroke of genius. As I careened down the water slides while looking out over the ocean, I giggled with happiness. There’s just something about the ocean, the waves and the shore that sharpens the senses and makes everything seem more fun. In addition to the beautiful views, there are three more reasons why I loved Raging Waters: unique rides, better-than-expected food, and lazy river root beer floats. After spending some time on the Morey’s Piers web site, I was excited to try Shotgun Falls – a quick slide that shoots you off to a six-foot drop into deep water. Just steep and high enough to give me a little thrill, this slide takes some practice. When they tell you to sit up straight, do listen. Lean too far forward and you’ll land on your face (as my daughter did), too far back and you’ll back-flop flat onto the water (as I did). Try it a couple times to land the perfect shot into the water. My nine-year-old daughter and her friend loved the Sky Pond Journey, which sends you down short sections of slide into four different elevated pools. They loved being able to float and talk and laugh in between each section. Unfortunately, you had to wait in each pool for an attendant to pull you to the next portion of the slide. There were several people waiting in each pool to go down the next slide, and it was difficult to paddle to the slide entrance, so everyone waited their turn. Slide, wait, slide, wait. The girls loved it, but my favorite was the fast, long, and twisting Rocket Raft Slide. I also attempted the rope swing. I hadn’t tried one since the old days at Action Park. I imagined myself swinging back and forth like Tarzan then gracefully jumping into the water. What I did can be most accurately described as jumping off the edge and sliding immediately down the rope, causing rope burns on the backs of my thighs. It wasn’t pretty, but it was pretty fun. And I’d do it again. The girls spent a lot of time in the Activity Pool, just swimming around and chatting. One entire wall of the pool forms a gentle slide that’s great for all ages. Eating at some water parks involves waiting on a long line, searching for a table, then ultimately standing while you try to balance your tray and eat at the same time. 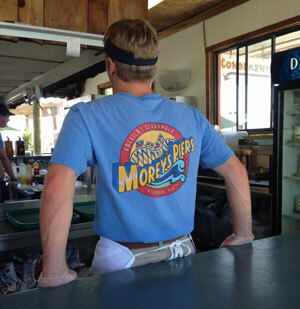 If you grab lunch at Wrecker’s Beach Grill, you can eat at an umbrella-covered table overlooking the ocean. But if the tables are full, simply take your food out onto the beach! Wrecker’s serves a wide variety of food – burgers, wraps, salads, hummus, personal pizzas, ice cream, churros, and more. I had a fresh Buffalo Chicken wrap, while my daughter had Texas Taters – tater tots topped with taco meat, shredded cheddar, and diced tomatoes – and a churro for dessert. And it was all excellent. Right next to Wrecker’s is Camp Kidtastrophe, the perfect place for younger kids to frolic with tiny slides, water guns, sprays, and more. It’s also right on the beach – I enjoyed my time lounging in a chair, soaking up the ocean air, while the girls ran around and sprayed each other. 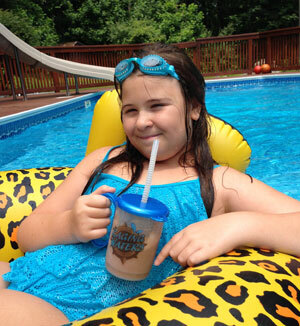 Imagine floating along the lazy river with an iced-cold, root beer float in your hand. Yes, you can! It’s easy to miss this feature, which I discovered from a video on Morey’s Piers’ web site. Not many people seem to know about it. As we parked our tubes in front of Trader Sams and climbed up on the rocks to order, I noticed several people pointing and commenting with surprise. The girls felt extra-special – like they had an insider’s secret – as they floated along sipping their floats. I didn’t have a camera with me in the lazy river, but my daughter has re-created her float at home with her souvenir mug. 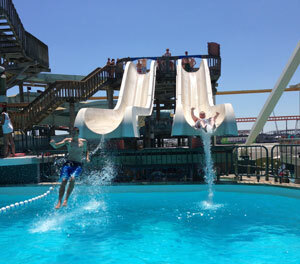 Raging Waters Water Park at Morey’s Piers is a full day (or more!) of fun at a classic Jersey Shore boardwalk location. Between the beach, the rides, the food, and the water slides, you’ll go home sun-kissed and satisfied. Love the Lazy River Root Beer floats, what a fun insider tip!! I was a bit unsure at first because we didn’t see anyone else doing it. But the girls loved being “trendsetters!” LOL. We do the Morey’s Piers thing every year when we do our week in Stone Harbor which is just north of the Wildwoods, but haven’t hit the water park yet. This might have to be the year–looks fantastic! Oh, and another vote for the rootbeer floats here! I’ll be following your social media, Gina – can’t wait to hear about your experiences. And they didn’t even mind that my cash was soaking wet when I paid!